An enlightening panel discussion at Hyderabad Lit Fest. The Hyderabad Literary Festival (HLF), which was held at Hyderabad Public School (HPS) in Begumpet for three days, concluded on 10th January 2016. I visited the venue and witnessed some of the sessions on the concluding day of the festival. I found two sessions to my liking – one, a panel discussion on ‘Indian Prime Ministers’ and the other, was an interaction with writer Hindol Sen Gupta, who authored the book ‘Being Hindu-Old Faith, New World and You’. The panel discussion on the topic ‘Indian Prime Ministers’ was conducted in the pre-lunch session and I found it particularly interesting. 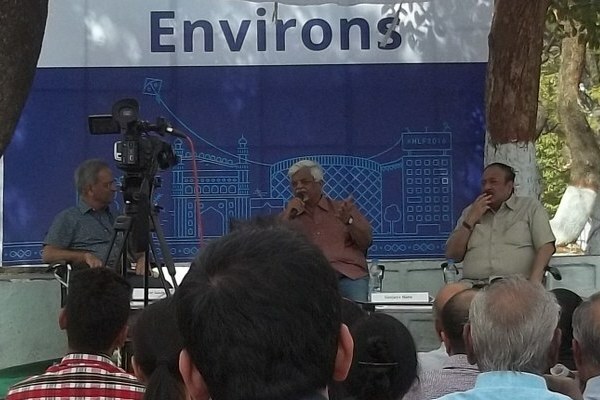 The participants were Sanjaya Baru, the media advisor to the former Prime Minister Manmohan Singh and Kingshuk Nag, the resident editor of the Hyderabad edition of the Times of India. Both are eminent journalists and successful authors. Sanjaya Baru’s book ‘The Accidental Prime Minister’ caused a lot of controversies but also became a runaway success. They are not only enormously experienced but also possess some insider knowledge about the functioning of the various governments. The session was moderated by Mr. Ajay Gandhi, the founder trustee of Manthan Foundation. Both the panelists agreed on the success of the incumbent Prime Minister Narendra Modi’s foreign policy. They stated that Modi’s foreign visits have so far been productive, improving our relations with many countries especially Russia, Japan and the US. His leadership gave a new impetus to the conclusion of some landmark deals with some vital countries. In fact, Baru has praised Modi’s attempt to make peace with Pakistan and contended that Pathankot attack happened because his Lahore visit was a success. So in stark contrast with what we read and hear in the social media and even in the Main Stream Media that Modi is spending more time on foreign soil with hardly any achievements to his credit, the two luminaries were in sync with each other in stating that Modi’s foreign policy, so far, has succeeded in bringing about perceptible improvement in the foreign relations. Sanjaya Baru said that the electorate of India is not really unforgiving of corrupt politicians. He quoted the example of Tamil Nadu, where people invariably elect corrupt leaders. Then he turned his attention to the innumerable scandals that took place during the UPA regime. He said Congress could not manage the situation as it took a defensive posture and was too apologetic about the scams. He criticized the strategy adopted by the Congress party and observed that “You don’t fight against your adversary on his terms. You fight on your terms. They should have managed to turn the attention away from the corruption scandals and should have been able to control the narrative. Instead, they turned too defensive and apologetic, and gave an opportunity for the opposition to exploit the situation”. Indeed, an interesting insight given Sanjaya Baru, the former media advisor to Prime Minister, on how politicians deal with the situation when they are inundated with corruption allegations. Kingshuk Nag sounded very interesting and did not mince his words while making some critical observations. When Sanjaya Baru praised Nehru as the greatest Prime Minister India ever had, Nag dissented from him and stated that Nehru, though had a golden opportunity to bring about many changes in the then newly independent India, he did not do anything in that direction. He opined that Nehru hardly brought about any administrative reforms and continued the British legacy and even went to the extent of terming him as the last viceroy of British India. He further stated that Nehru grossly mismanaged the foreign policy and opined that Kashmir problem and the problem of Tibet are the legacies left by Nehru which have become the millstones around the neck of India. On another instance, Nag called Manmohan Singh as the Prime Minister to the empress Sonia, which triggered peals of laughter from the audience. He even referred to Nehru’s affair with Edwina Mountbatten, which in his opinion, influenced the shape of the Independent India, triggering another bout of laughter. Baru was of the opinion that Manmohan Singh, after he got a second term, felt that it was his victory and he could operate more freely. However, congress made a constant and continuous effort to bring Rahul Gandhi. Had the Congress fared well in 2012 UP assembly elections, the congress people would have made Rahul the Prime Minister of India. Baru and Nag agreed on the contention that Modi’s chances of success will depend on how well he controls Rashtriya Swayamsevak Sangh (RSS) and keeps the extreme elements at bay. India, being a pluralistic society, can’t afford to have a government which takes extreme positions. So Modi will achieve success as long as he follows a middle path. Nag observed that A. B. Vajpayee was successful till 2002 Gujarat riots, and after the riots took place his position started becoming weaker. However, both the authors agreed that Modi, being a Gujarati and a practical man, will definitely make further changes to his style of functioning. Nag seemed to be particularly impressed with Modi’s abilities to learn things very quickly. He cited the example of how Modi, who was a poor communicator in English, quickly managed to improve his English skills. Baru was of the opinion that Modi, with his effective foreign policy, managed to position himself as one of the most prominent third world leaders. So all in all, I derived the satisfaction of witnessing an enlightening session which gave some insights into the functioning of various Prime Ministers, who for one or the other reason achieved fame. This entry was posted in Politics and tagged Hyderabad Lit Fest, Kingshuk Nag, Narendra Modi, Sanjaya Baru on January 12, 2016 by Dr. Ramachandra Reddy.